We've got some amazing news to announce today for Skyblocky's future! Today, we're proud to announce that Skyblocky will have a full reset on the 23rd February, 2019. We've been holding polls for a while! We've listened to all the results of the polls, and have decided to follow them, as it's what our community wants! As such, I'm excited to announce some of the new features that will be coming to Skyblocky! From now on, you will be able to Auction your Island off to the rest of the server! This will function in the exact same way our AuctionHouse does. Only owners will be able to list their Island on the Auction! Once an island is successfully auctioned, all members of that Island will be removed and the buyer will be given ownership. Our territories system will allow Islands to fight for victory! Players will be able to capture the territory by standing in a square for 5 minutes, and while captured, all island members will receive perks! Once a week, our resident dragon, Albus, will attack the Tower on our Territory! His immense power will rip apart the tower, and will cripple anyone near it! However, our brave Skyblocky Warriors have decided to taken him on, for a prize of course! You will be able to enter the battle, and the last Warrior surviving, will grant his island members a reward, as a sign of our eternal gratitude. We've employed these pesky little buggers to help all our players with choirs around their Island! You'll be able to set their choir, name and even their clothing. They'll be available on our store soon! We've got another brand new event coming to Skyblocky too! Participating players will be teleported to an arena, and they'll be given snow blocks and a Diamond Shovel. The first player to reach the chest above wins! You'll be able to mine others snow blocks and even throw a sneaky snow ball! We've also got a ton of smaller changes that are coming too! We'll be resorting back to Stacked Spawners, as it seems like that's preferred. We'll be redoing the economy, and taking player feedback into account. Island Ore Generators have now been added. Jobs and Achievements have been fixed. You'll now be able to use /printer too. Crates will be physical again, instead of virtual. Brand new Builds and Starter Islands! The top three players who report the most valuable bugs will be given a voucher ($50, $40, $30), and anyone who reports major bugs will also be given a voucher, the amount depending on the severity of the bug! 6:00 PM (EST) or 10:00 PM (GMT) on Friday, December 7th, 2018. >> The shard and job system from Skyblocky 2.0 is returning. Jobs are specific tasks like mining, fishing, or farming that players can complete to receive a currency called shards which can be used in the /shardshop. Every time a job is completed, it gives separate ‘job experience’ - 1 to 15 job exp per each action. Every 50 exp gained, players level up. Every level, players receive a shard, which goes into their “Shards” balance on the sidebar. Every 5 levels, players have a 25% chance to receive a supershard along with their normal shard which can be used in the supershard category in the shardshop. What is in /shardshop? Spawners: these range from Skeleton all the way to Iron Golem & Villager. What is in the supershard category? >> What will upgrades, island level, and tokens look like? Hello! - and welcome to the thread announcing this traditional Skyblocky Reset! 4:00 PM (EST) or 8:00 PM (GMT) on Saturday, November 3rd, 2018. What will the economy look like? Based off of the May 5th reset economy. - The season will be at least 3+ months long! - Money is made by farming (cactus mainly), iron-golem, and villager grinders - silverfish & ocelot spawners will be removed. - Voting will be super OP as before. - Crates will be those of the May 5th reset with minor adjustments. - Global-kits will be less over-powered than last reset - however ThunderKit's loot will still rock the server! - Boss-Eggs will not be obtainable via any kits besides KoalaGod's new kit, Deus. They must be purchased on Buycraft individually. - KoalaGod will be getting several epic new commands you can show off & won't be seriously disrupting the economy anymore. - Pouches will be obtainable via some global-kits, KoalaGod's kit, Deus, and individual purchase on the store. - Mobcoins will be REMOVED! - Monthly Crates will be far less OP. Though the last season has had a lot of new (yet not unwelcome!) changes for the content and style of our server, it's gone alright: and I'm pleased to announce that next reset will be better. I don't want to make empty promises here, but I can't say any more until news is announced soon! As to my end of the boat here, next reset will be filled with fun community-oriented events like a build competition, a spookified spawn, back to weekly giveaways (not only on Twitter, but on other platforms too! ), and maybe a treasure hunt like last year, or whatever else is achievable! Feel free to message me if you've got some event ideas - I'd be happy to hear them and do my best to see them to reality! You may also use the suggestions section as well if you've got any other ideas, whether event related, content based, or otherwise. Remember we're always looking for new staff members as well. Requirements are here, and application is here. If you're denied don't lose hope, you can always message a staff member on the applications subteam if you'd like a further in-depth explanation of the denial message explaining what you can improve upon & a date for when you can reapply. Sadly I don't have much else in store for this announcement, but I assure you all we'll have another announcement soon packed with detail about upcoming events & dates. For now, check out last month's top voters: congratulations to you all! Hello everyone, and welcome to the official announcement thread for this Skyblocky reset! I will be going over everything that's being added/changed in this thread. But before I get into that, let it be known that the release date for this reset is..
All chests, enderchests, and inventories. Temporary purchases such as crate keys. What will not be reset? Summer Build Competition Winners & More! Another great month for Skyblocky! We’ve had over 6000 unique players join this month - I’d like to personally thank you all for being so welcoming to them. Every time someone new arrives to Skyblocky, I see so many players welcome them, offer to help them out, and start conversations. I’m so happy that this is how our community treats new players. We’re up to our NINTH weekly giveaway on the Skyblocky Twitter! You may enter this week's giveaway by liking & retweeting this post, and following @SkyblockySocial! There will be three winners who will receive 5x Villager Spawner EACH! Now, for the long awaited Summer Build Competition Winners! This competition’s theme was “Summer Activities & Events,” and each and every one of the entrants has created an amazing entry! Note: those who copied builds have been disqualified. Summer Build Competition, Weekly Giveaways, & More! The first bit of Summer has gone by, and everything is looking forward for Skyblocky. Hope everyone is having fun taking advantage of the weekend sales: store is 85% off right now! 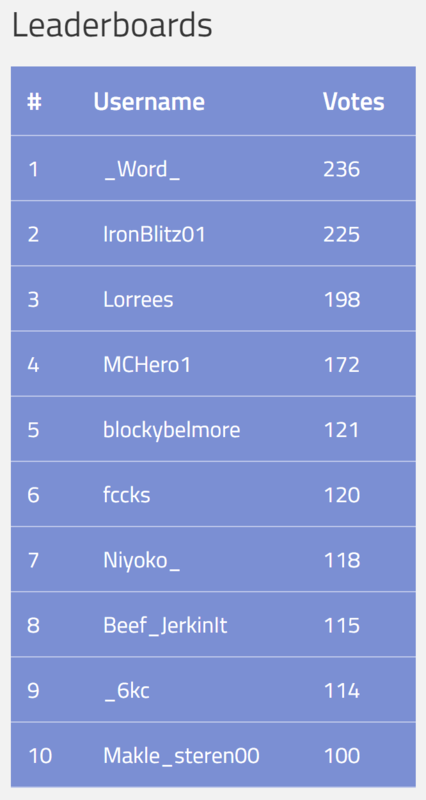 Weekly giveaways on the Skyblocky Twitter have been going swimmingly well - five giveaways so far, and more coming! You may enter this week's giveaway by liking & retweeting this post, and following @SkyblockySocial! There will be two winners who will receive 5x Villager Spawner & 5x Iron Golem Spawner EACH! Winners will be drawn next weekend as always. Second up on the list for today's announcement: We will be hosting a Summer Build Competition! All places will also receive the HEAD of each admin+, and a custom signature from every admin and myself on their island. Build your entry on your island. Comment your in-game-name on this post. Entries will be judged by admins starting July 25th, and winners will be announced on August 1st. Finally, Congratulations to the Top Voters of June! **Unfortunately the website is glitching, so these numbers are carefully calculated & as accurate as possible. Weekly Giveaways, Top Voters of May, and the Summer Season! Who’s excited for Summer? School is out for most of us (not me, yet!) and Skyblocky is gaining players faster than ever! We’re going to have a great Summer season, with tons of events, giveaways, and fun content for you all to enjoy! I’m so happy to announce that the most recent map & island reset has been a success - the economy is much better than previous, and everyone seems to be enjoying playing with each other! Hopefully we’ll have some new content in store for you all throughout the coming season. And, here’s some exciting news for the Skyblocky Twitter: we will be having weekly giveaways hosted on the Twitter! All you will need to do to enter will be to retweet and like the post, and follow @SkyblockySocial! This week, 5x Villager Spawners will be given away! This is worth $25 on /buy! Retweet & like THIS post to enter. A winner will be drawn on Friday of next week, and the next giveaway will go up then. Lastly, of course, congratulations to the Top Voters of May! You all will be messaged your vouchers either in-game, on the forums, or on Discord. Congratulations! As you all know, Skyblocky will be resetting. After much anticipation, I finally have the exact date and time. Now, as to the reset we’ve all been waiting for! Along with many more features to be released afterwards! The economy will be entirely changed due to the undesirable outcomes with the current economy. The new one will be based around obtaining spawners through crates. Cactus will be a large part of this new economy. You will not be able to directly obtain more spawners with the profits made from your current spawners, which will hopefully prevent the major inflation problems which occurred recently. Remember, if you have any suggestions feel free to message me here or on Discord (Evergreen#7184) and if you have any questions, concerns, or issues you may message any staff member and they’ll be happy to help. I’ll be responding to all reset-related questions on this thread, so you may post those here! Thank you for playing on Skyblocky! Rule Updates, Top Voters of March, and Happy Easter! Happy Easter! I hope all of you are enjoying your day. Best wishes for the coming season. I've got two major things in store for this announcement. To start with, as always, top voters of March. You all will be messaged your vouchers either in-game, on the forums, or on Discord. Congratulations on winning! Next month, vouchers will be for $75, $50, and $25 for the top three voters. Next on the list: rule updates! Click here for the rules. All updates have been put into place. Updates take effect at 7 PM EST, April 1st. - Verbal warnings were added for several rules, as well as shortened punishments. - The spamming chat rule has been completely redone. Make sure to read it over. Hopefully it's a bit more fair now. G'day I'm an active Skyblocky player who Loves to help fellow players and friends in the wonderful community of Skyblocky! -toot!